Located at the far western end of Long Island, Brooklyn is the most populous of New York City’s five boroughs. The borough began to expand between the 1830s and 1860s in downtown Brooklyn. The borough continued to expand outwards as a result of a massive European immigration, the completion of the Brooklyn Bridge connecting to Manhattan, and the expansion of industry. By mid 1900s, most of Brooklyn was already built up as population increased rapidly. 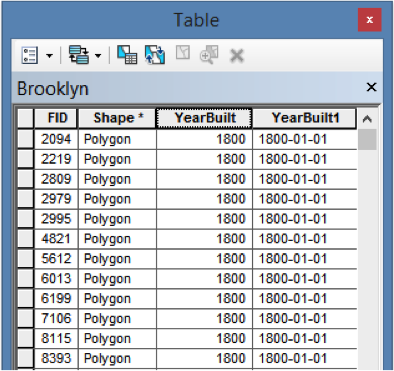 To present the structural episodes of Brooklyn’s built environment, QGIS 2.10 was utilized with the Time Manager plugin. QGIS is an open source GIS application that provides data visualization, editing, and analysis through functions and plugins (https://www.qgis.org/en/site/about/). The Time Manager plugin animates vector features based on a time attribute (https://plugins.qgis.org/plugins/timemanager/). This tool was effective in presenting a time series of Brooklyn’s building construction dates. To create the time series, the PLUTO SHP was downloaded and prepared by removing any unnecessary fields. The columns of interest are: FID, Shape, and YearBuilt. Because we are interested in the time column, the formatting must fit with QGIS Time Manager. QGIS Time Manager requires timestamps to be in YYYY-MM-DD format whereas the building dates in the PLUTO SHP are in a four-digit format. Therefore, the date in the dataset must be modified to fit the Time Manager format before it can be brought into QGIS. 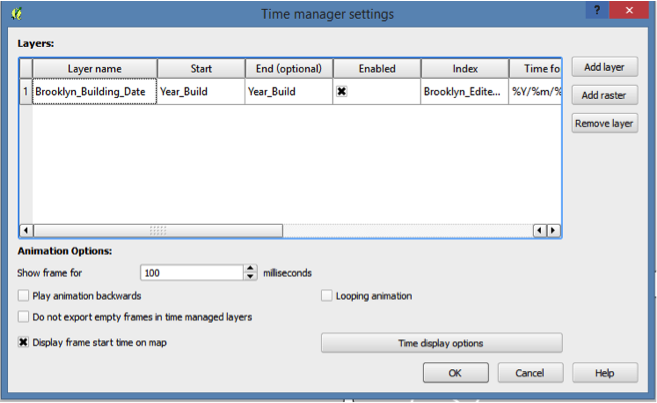 In QGIS, Time Manager plugin must be installed first. The SHP can then be added into QGIS as well as other Shapefiles needed: roads, highways, state boundaries, etc. Note: to use Time Manager, the data must be in SHP format. Once the data are added, the polygons (i.e. buildings) are styled based on age. This will be effective in distinguishing the oldest buildings from the newest. In QGIS, there are a large number of options available to apply different types of symbology to the data. The layer is styled based on the attribute Year Built, since the time series will show urban layers using building dates. Also, Graduated is chosen because features in the layer should not be styled the same way. The other data file, such as roads, highways, and state boundaries, are styled as well. Once all the data are added and styled, it can be oriented and applied to the Time Manager plugin. To truly see the urban layers, the map is zoomed on the upper portion of Brooklyn. In Time Manager settings, the layer with building dates is added and the Start Time is the Year Built field, which includes the timestamp data. To get features to be configured permanently on the map, in the End Time option “No End Time” is selected. For animation options, each time frame will be shown for 100 milliseconds, and timestamp (i.e. built year) will be displayed on the map. In the Time Manager dock, the time frame is changed to years since the animation will be showing the year the construction of the building was completed. The size of the time frame will be 5 years. With these settings, each frame will display 5 years of data every 100 millisecond. Playing the video will display the animation inside QGIS, and one can see the time scrolling from 1800-2015 in the dock. Time Manager also enables you to export the animation to an image series using the “Export Video” button. Actual video export is not implemented in Time Manager. To play the animation outside of QGIS, various software applications can be used on the resulting image series to create a video file. In addition, QGIS only allows users to insert a legend and title in the Composer Manager window. Currently, it is not possible to get the legend rendered in the main map window. One approach to generate a video with a legend is to create a dummy legend and add the image containing the legend into the PNGs that Time Manager produces. 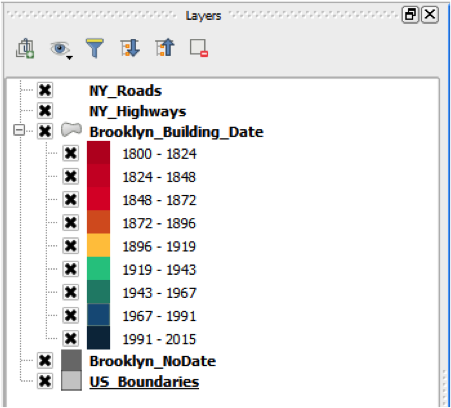 A dummy legend and a title for Brooklyn’s urban layers was created outside of QGIS, and added to each PNG. Finally, to create a time-lapse and compile the images together, Microsoft Movie Maker was utilized. Other software applications can be used, including mancoder and avidemux.